The dwarf Cucut premiered a year after Roc and Laieta, the giants of Plaça Nova, and "big-heads" Tano and Beco, built in 1906 by The Christian Art of Olot, the Feast Committee of Sant Roc commissioned a third dwarf to the workshop The Religious Arts of Olot. Toribi Sala had already made a "big-head" following the style of Olot with the model of the character drawn by Gaietà Cornet that gave the name to the Barcelona magazine Cucut. The one of the Plaça Nova resembled the "big-head" from Olot, but it looked more like the drawing of the magazine. 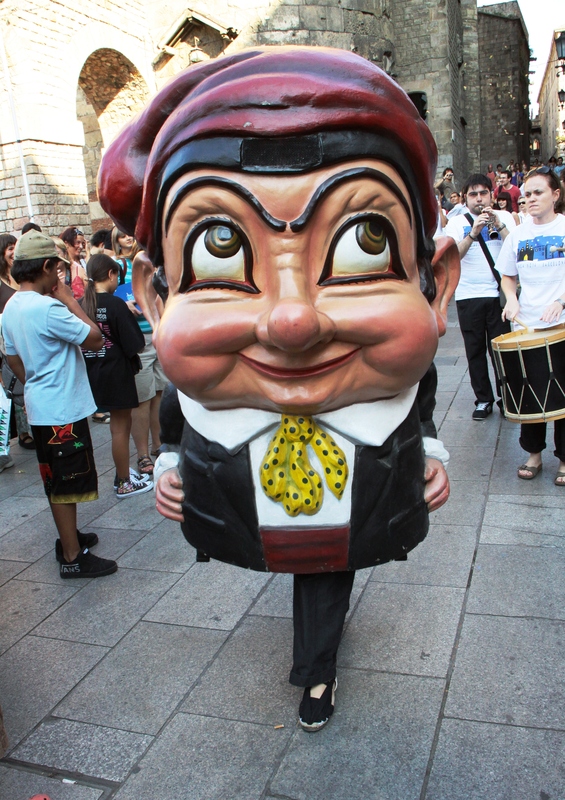 The "big-head", with beret, bow tie and umbrella, riding a donkey, took part in the Feast of Sant Roc and other children celebrations until 1924, when, stored in a warehouse, it was damaged and dissapeared. In 1986 the Feast Association of Plaça Nova wanted to recover Cu-cut to accompany the giants. The commission was made to Domènec Umbert, who built a Cu-cut with much softer and childish traits, the "big-head" turned into a kind of giant-dwarf, as it was carried like a giant with an easel, and the figure casing covers the whole body of the wearer as with the dwarves. It premiered on August 15, 1986. In 1987 it traveled to Japan, since then it has become one of the most popular characters of the holiday imagery of Barcelona. The Cu-cut has its own dance with a melody adapted by the grallers La Pessigolla over a few bars of The Magic Flute by W.A. Mozart. It participates with its dance in the courtship of Sant Roc, patronal feast of the Gothic Quarter of Barcelona, ​​on August 16. It also participates in February in the Feast of Santa Eulàlia -the winter Major Feast of Barcelona-, ​​in September the Feast of la Mercè and the Corpus Christi procession in Barcelona, ​​accompanied by the Grallers La Pessigolla de la Plaça Nova.